Each season, it’s always fun to come up with some kind of holiday bucket list of activities to either do on your own, with family or with friends. The holiday season is my FAVORITE time of the year and also packed full of things to do with your family and with little ones. Listen to Christmas music every, single day up until New Years. I have no shame when it comes to Christmas music and decorating. I have been listening to it since before Halloween! Give me all of the Michael Bublé and Bing Crosby classics. Make snow ice cream. This is something that I did every year as a kid with my siblings. You just take a little bit of fresh snow, a splash of milk, a cap full of vanilla extract and some sugar and mix it well. It makes a vanilla bean-esque snow slushie. Since we will be somewhere that actually has some snow, this is absolutely happening when we go to Flagstaff. Take my kids sledding. Can you believe they have never been? To be fair, Arizona really doesn’t have snow so unless we drive up north, sledding is kind of out of the picture. We are going to Virginia right after Christmas, and they will get plenty of sled time in then. Take a Christmas lights tour. The lights and decorations are one of the best parts about Christmas. Everything is so sparkly and glittering and gorgeous! I love just driving around and seeing everything lit up. We actually get to deck out our own house this year as well, since we no longer live in a condo. Yay! Make a Christmas Eve goodie box for my kids. I have been doing this for the past few years now, and it is always a hit! I saw a similar idea on (where else) Pinterest, that was a Christmas Eve gift for little ones, and adults too if you wanted. I include pajamas (matching of course), a Christmas movie or book, a snack and some other little Christmas related gift. We always open up one gift on Christmas Eve but I thought that this would make it much more exciting to open up. Enjoy every moment. I have a goal to try and be as low-stress as possible this year and just to take everything in strides. Christmas is about blessings and the joy of being around loved ones, not worrying so much about every last detail, which is hard coming from a perfectionist like me. 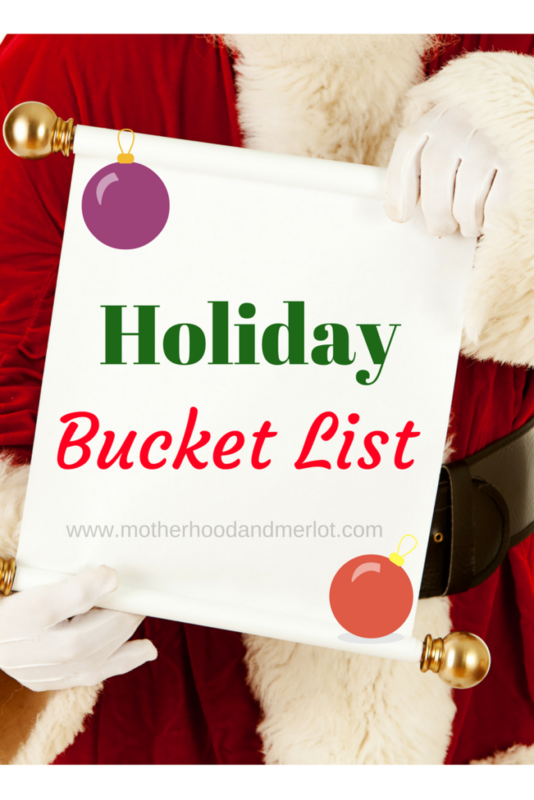 What’s on your bucket list this holiday season? If you don’t have one, I challenge you to make one! 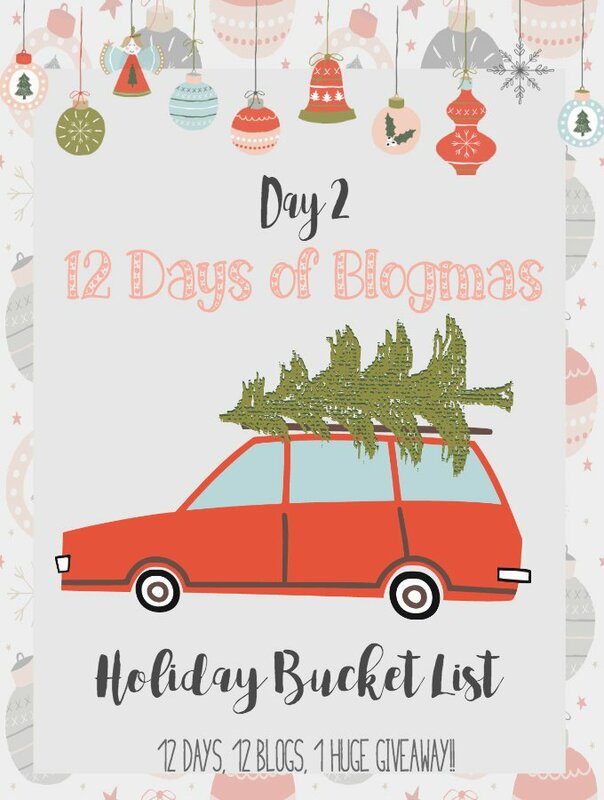 See more Holiday Bucket Lists from the ’12 Days of Blogmas’ Bloggers! I should send you a picture of the Hot Cocoa bar I did a couple of years ago…it was a lot of fun! I set up a coffee bar recently but, would love to add hot chocolate, candy canes and holiday flair to it! Great ideas. Happy holidays! Sounds like a great list! The hot chocolate bar is a great idea! Okay this may seem odd but I pinned your bucket list because I absolutely HAVE TO make your snow ice cream! What kind of sugar do you use? White? Brown? I can’t wait to give this a whirl – my girls will FREAK out. So many fun things! Thanks for sharing and for linking up to the #SHINEbloghop! Awesome! What kind of sugar do you use? Does it matter? For the kiddos I just use regular white granulated:) You could probably change it up if you don’t use real sugar. I learned to make snow ice cream with sweetened condensed milk. It takes the guess work out of how much vanilla and sugar to use. I love your list and I might add daily Christmas music if my family will tolerate it. Oh I will have to try it like that! There used to be a house on Elliot and (roughly) 48th street that had THE BEST xmas lights every single year. We would walk down to that house and look at it multiple times throughout the season. I remember it being one of my favorite things about xmas every year! It sure sounds festive at your house. It is not cold enough here for snow ice cream, but the hot chocolate bar sounds really good to me. When we lived in Arizona I always said we would go to Flagstaff so the kids could play in the snow but we never went 🙁 I hope you all get to enjoy it! We are doing that this year and I cannot wait!!! I love all of these ideas! We usually go on a Christmas lights tour 1-2x a week [Saturday night’s] with the kids and they love it! Great bucket list! I’ve never had snow ice cream but have heard its delicious. Texas really doesn’t get the good snow for stuff like that. Our bucket list always includes Christmas movies, Mexican food for Christmas Eve night & a lavish brunch spread Christmas morning. We also enjoy Christmas light looking with yummy coffee & treats. What a fun project – I’ll have to check it out! This is a fantastic list! I love the hot cocoa bar and the movie marathon! I have had ABC Family’s Christmas schedule printed and on the fridge for at least two weeks now. 🙂 Have a very Merry Christmas! Great ideas! There is a neighborhood here in Tucson that puts on a huge production. In fact, in order to move in you have to agree to participate in the festivities! LOVE the hot chocolate bar! I’m convinced I’m doing that this year! I usually try to do it during a Polar Express night! We also do the snow ice cream!! So so good!! I enjoy your holiday bucket list–it’s very warm and happy. A goal of mine this year is to actually enjoy Christmas music every day, too. Mostly because last year I was a Grinch and refused to listen to it until almost the week of. No idea why, even. I don’t quite do a Christmas Eve box yet as my kids are still so young (2 and 3 months) but they get matching pjs, a stuffy and a christmas book! Hot chocolate bar on Christmas morning? This is BRILLIANT! Of course with Baileys and Schnapps. I love the idea of the Christmas movie marathon too! Great ideas!! Thank you to you & Julie for hosting this. I’ve had Christmas music on for days now! I am so ready for the holidays. I love your tips and can’t wait to see more holiday suggestions from you! What a fun list! I’m so glad the holidays are here! We have been watching a different Christmas movie every night after my husband gets home, before the kids go to bed! I love it! You have some great ideas! I think that my kids would love to make snow ice cream. We haven’t done that before. Very fun! I go out looking at the Christmas lights every year! These are all such cute ideas! Thank you so much for sharing this one.